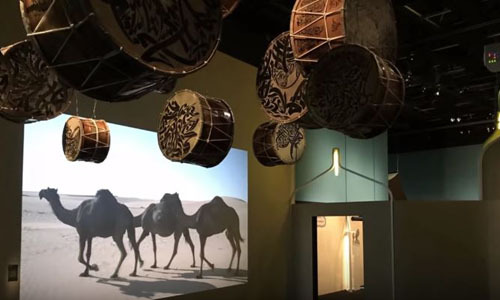 Visitors to Al-Musiqa, an exhibition on the “voices and music of the Arab world” that opened at the new Philharmonie de Paris concert venue in Paris in April and continues until 19 August, may be disconcerted to find themselves greeted by a film of camels in the first room. What has this to do with Arab music, the promised subject of the exhibition, they might ask. They might also wonder what camels, associated most with certain desert, or at least non-urban, parts of the Arab world, might have to do with what has been primarily associated with its major urban centres, among them cities like Cairo and Baghdad. Even learning that the film is actually a piece of video art (by artist Wael Shawky) may not be enough to still some nagging doubts. Artworks, perhaps particularly contemporary artworks, may have a place in illustrating the subject of an exhibition, particularly when that subject is something as evanescent and intangible, even invisible, as music. 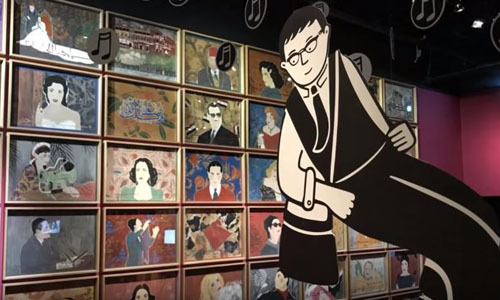 However, when they more or less take over the exhibition, as some might feel they do here — every room includes at least one or two — the question arises of how visitors who thought they were going to see an exhibition about music should react. Perhaps they did not come to see works of contemporary visual art. The exhibition is divided into seven parts, broadly speaking seven environments in which Arab music has historically been produced. 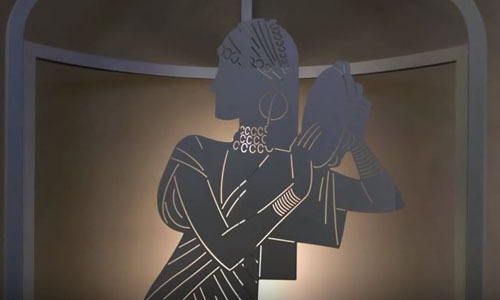 While this draws attention to the fact that music is social, even sociable, in its production and consumption — it needs players and an audience, like theatre, to achieve its effects — it is easier to recreate the environments of late 20th-century Arab popular music, as the exhibition seeks to do in its final rooms, than the caliphal court of mediaeval Baghdad. Music in theory may be a private experience, but until the development of recording technologies at the beginning of the last century in practice it was almost necessarily a social one. People gathered to play or listen to music, which was and is produced for occasions as varied as weddings, funerals, religious ceremonies, and military and political events, and to accompany activities like eating, storytelling, partying, or meetings among friends. Music or musical techniques in the Arab world have been used on religious occasions (including chanting the text of the Quran), or in traditional forms of entertainment (such as performances of oral tales). There has always been a division between the theory and practice of music, and there have long been parallel traditions associated either with treatises by scholars writing on music or with more popular forms. The exhibition has a lot to say about the latter, perhaps especially the music of the past few decades. The final rooms, taking visitors through the originally North African rai music that was popular in France in the 1980s and beyond and the role of music in contemporary youth culture, are given far more space, and contain far more music, than earlier ones on the history and traditions of Arab music. There is little about the theory of Arab music. No visitor to this exhibition will learn much about the enormous amount of philosophical writing about music that has been produced in the Arab world, and no visitor will come away with anything more than a sketchy sense of how Arab music is put together, particularly in its employment of non-Western scales, rhythms and tones. Perhaps the curators felt that this would have been inappropriate for an exhibition directed at a general audience, though some visitors might feel that this lack of faith is misplaced. No such reticence marked the fascinating, and almost fanatically cerebral, exhibition on the music of the late French composer Pierre Boulez, who lends his name to the Philharmonie’s main auditorium, which took place at the neighbouring Cité de la Musique in 2015. Boulez, who died in 2016, was one of the major figures of post-War European music, and his habit of generating acres of music theory, illustrated with just a few minutes of the actual stuff, was a cliché of his career. Isn’t it supposed to be the other way round, sceptics asked. Perhaps the present exhibition has gone to the opposite extreme. As it points out, music in the Arab world had had a variety of social uses, including in youth culture and political protest. 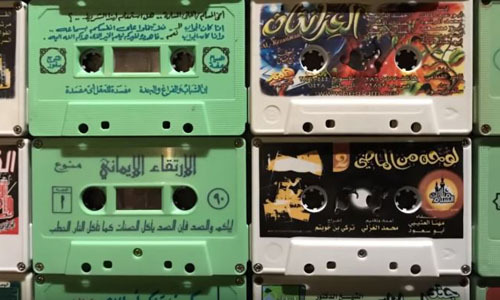 However, the sociology of music is not the same things as music itself, and a survey exhibition could have placed less emphasis on contemporary pop and more on the history of music in the Arab world. A season of Arab music at the Philharmonie accompanies the exhibition, and deficiencies in the presentation are to an extent made up for in this programme of events. It includes performances as different as “An Aleppo Music Salon in 1930”, a reconstruction of music played in Syria in the early decades of the last century, and L’Afrique arabisée, “Arabised Africa”, which includes gnawa music from Morocco and music by Mauritanian griots. The former is a kind of Berber music traditionally played at religious events, while the latter is associated with traditional storytellers throughout West Africa. Visitors may also take material for further reflection from the exhibition itself. Room one, for example, disconcertingly dominated by camels, also looks at the origins of styles of Arab singing in oral performances of pre-Islamic poetry (there is a recording of a reading of the muallaqa of sixth-century Arab poet Imru Al-Qais). 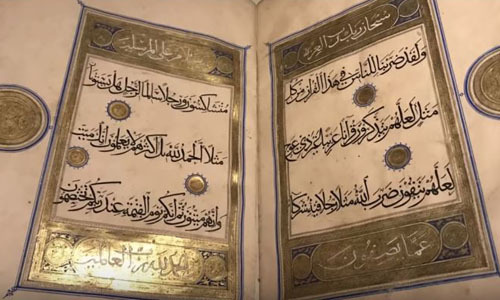 Room three, on “court music from Damascus to Cordoba”, is perhaps the least successful, in part because of the complexity of the material, the very long time frame from the seventh to 15th centuries, and the geographical scope of Damascus, Cordoba and Baghdad. 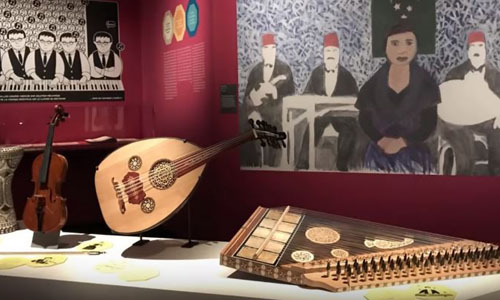 As the exhibition notes, it was during this period that Arab philosophical writing on music appeared, developing out of earlier Greek and Hellenistic authors and perhaps also drawing on Persian influences. While the exhibition does not go much further than give the names of the ninth-century writers Al-Kindi, Al-Farabi, and Ishaq Al-Mawsili, philosophical polymaths who put Arab music on secure foundations, it may send visitors to the accompanying catalogue which contains some strong complementary essays. The exhibition is on stronger form in the rooms that follow, not least because for the modern and contemporary periods there is a much wider choice of illustrative material. Films are used to illustrate gnawa music from Morocco, associated with the devotional singing of Sufi religious orders. There is an evocative collection of vintage musical instruments (though little about how they are played), some of them with an evocative provenance. There is a nefir, a natural trumpet (no valves), for example, acquired by the French musicologist Guillaume André Villoteau in Egypt in 1801. Villoteau was one of the researchers who accompanied the then French General Napoleon Bonaparte during his invasion of Egypt in 1798, later writing the sections on Egyptian music in the monumental Description de l’Egypte. There is also an early 19th-century Egyptian rababa, a type of bowed string instrument sometimes called a spike fiddle. However, the exhibition perhaps only really gets into its stride in the final sections on 20th and 21st-century Arab music. Here there are nods in the direction of standard ethnomusicology, including matters of musical training, the development and transmission of repertoire, often by electronic means, the economics of the musical profession, for singers and orchestral players alike, performance contexts, and audiences and reception. Egypt receives extensive treatment, befitting its position during the 20th century as the musical capital of the Arab world. 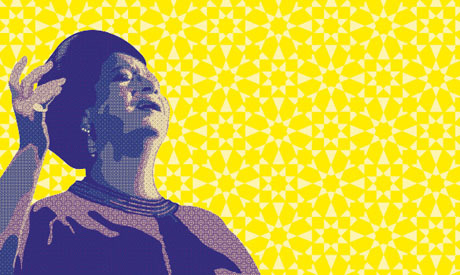 There is information on the tradition of female divas, culminating in figures like Laila Murad and Um Kalthoum whose music-making, drawing on older traditions, relied upon technologies such as radio, gramophone records, and films to reach a wider audience. The treatment of important developments in the period, such as the Congress of Arab Music held in Cairo in 1932, is glancing at best, though there is an informative longer article about the Congress in the catalogue. 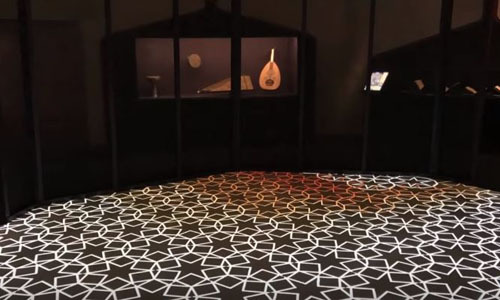 The exhibition ends with 20th and 21st-century North African music performed and circulated in France. Major figures here include singers like Warda Al-Djazairia, Slimane Azem and Dahmane Al-Harrachi among many others, all of Algerian descent and helping to keep North African popular music alive and developing in the cafes of the Barbès area of northern Paris, what the exhibition calls the “Médina de la Goutte d’Or”. in the 1950s during the Algerian War of Independence. 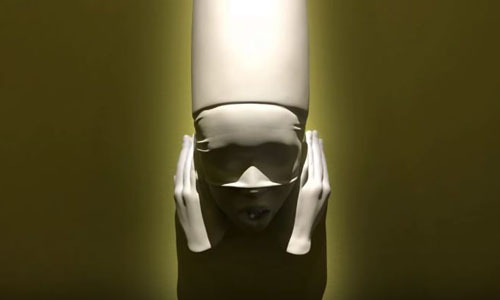 A final room looks at contemporary Franco-Arab fusion music, including pop figures Khaled and Rachid Taha, before referencing the contemporary music of social protest and the “Arab Idol” TV show.